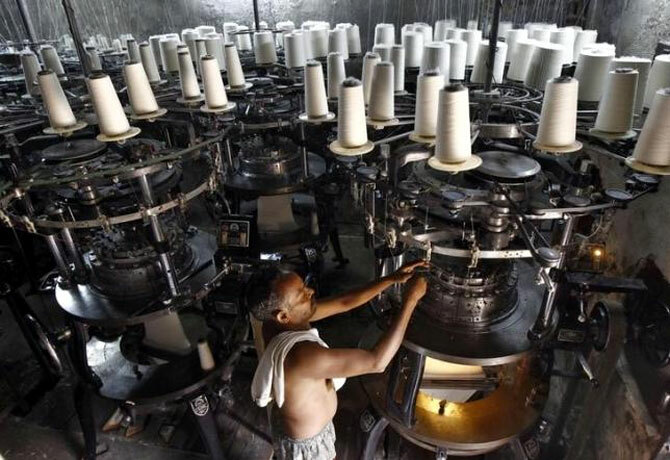 Rediff.com » Business » 'Make in India' idea is good but where's the resource? 'Make in India' idea is good but where's the resource? One year ago, Prime Minister Modi made the call to 'Make in India' -- to provide much-needed boost for the manufacturing sector. The government has, since, tried to address governance challenges through speedier clearances, or e-governance for greater transparency. Investment proposals worth Rs 1,10,000 crore or Rs 1,100 billion (for electronics) or 56 defence manufacturing permits are counted among the achievements. In other sectors (automobiles, railways and power), foreign firms have committed to increase localisation. Challenges remain, of course, associated with land acquisition, GST, or skills. But two related issues often miss attention: resource efficiency and innovation. As countries develop and per capita incomes grow, the contribution of manufacturing increases. Researchers at CEEW analysed manufacturing trends in more than 100 economies. If India followed a similar trajectory, for its current per capita income ($3,350 in 2005 PPP$), its manufacturing share ought to have been 19 per cent of gross domestic product. Instead, in 2013-14, the sector’s contribution stood at 15 per cent, having shrunk by 0.75 per cent over the previous financial year. It would seem that Indian manufacturing has settled into a low-level equilibrium over the past two decades. One reason is that India is affected by a 'resource inefficiency curse'. Its manufacturing sector is primarily natural resource-driven. Metals, chemicals, textiles and food contribute about 60 per cent of manufacturing. The average share of material costs in production cost is high at 78 per cent, compared to an advanced economy like Germany (40 per cent). This can be attributed to the low share of high-technology (R&D-driven) products in India’s industrial output and a high share of semi-finished intermediate goods (many imported) as inputs, resulting in lower value addition. India’s overall resource productivity (GDP per tonne of material consumption) as a result is one-tenth of Germany’s and significantly lower than other developing economies. Can recent declines in global energy prices help? Coal prices are at 12-year lows and oil prices have more than halved in the past year. Low energy prices must, then, be a boon to jumpstart manufacturing growth in India. While industry faces high energy prices, compared to global standards, energy as an input accounts for only five per cent of costs in Indian manufacturing. The fall in energy prices might provide temporary relief to corporate bottom lines, but the chronic issues of low R&D spending, low technology penetration and innovation and the dependence on overseas inputs to make up for these gaps remain the bane of Indian industry. Even with natural resources, opportunities to add value are missed. In the metals subsector alone, by adding value to the millions of tonnes of ore that are exported, GDP growth rate could jump by 0.57 per cent. The technologies to process some of these ores (say, lower grades of iron ore or energy efficient processing of titanium, a high value mineral of which India holds large reserves) are still not available or in use in India. Miners rake in the profits of exporting cheaply extracted ores but have not invested in technologies to move up the value chain. Growth and transformation in manufacturing cannot happen unless India espouses innovation. Total R&D spending is still teetering at less than one per cent of GDP. In Japan, South Korea or Israel this figure is 3.4 per cent-4.3 per cent. CEEW analysis suggests that broad-based technology areas, such as biotechnology, nanotechnology, micro- and nano-electronics, advanced materials and photonics, have disruptive potential to enable rapid innovation cycles. Nanotechnology alone has potential applications in products that contribute up to 85 per cent of the manufacturing sector value add. The private sector has to pick up the mantle for technology-enabled manufacturing. But in India, the private sector accounts for just a quarter of total R&D expenditure. If government (by virtue of its huge share of R&D investment) remains the engine of innovation, how will private enterprise grow competitively? Moreover, a strategic understanding of critical mineral resources is needed. The global shift towards technology-enabled products has resulted in the need for a range of minerals that were hitherto not part of the value chain. In developed countries, high productivity in resource use has been accompanied by high per capita consumption of resources. India will have to buck this trend and ensure that as it improves productivity, the concomitant rise in per capita consumption is kept in check. So far we have failed to recognise this in relation to manufacturing. The US introduced the American Mineral Security Act, 2015, to identify critical mineral markets and avoid supply shortages. India needs similar informed analysis that juxtaposes technology advancements and changing consumption patterns with resource endowments, environmental concerns, geopolitical risks in importing critical minerals, and rapidly shifting conditions in global commodity markets. For Make in India to truly succeed, industry has to recognise and act upon threats and opportunities presented by resource (in)efficiencies, technology-enabled value addition, and critical minerals. Foreign investment is necessary but no panacea; strategic direction is urgently needed. Wake up Modiji, why are you wasting crores on useless manpower?